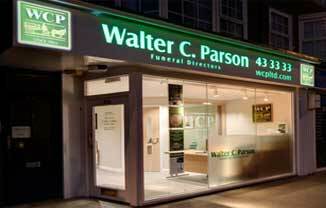 Callington Funeral Directors Walter C. Parson is a family business established in 1842. It has, either by inheritance or acquisition, remained in the family over seven generations. We strive to deliver a first class service, one which would only be acceptable to a member of our own family. We believe, maintaining this strong ethos through our staff and by training them to the highest standards of the profession, we are able to consistently deliver this service to our clients. We purchased The Old Police Station in December 2017. It has since been thoughtfully transformed into a funeral home to serve the people of Callington and the surrounding area. Our offices are situated in the centre of town at Saltash Road, with ample customer parking. Martyn Hall is the resident funeral director, with 15 year’s experience as a qualified funeral director. He is able to offer professional advice without obligation. Ask us for a quote, we’re probably less expensive than you think. "You offered us a flawless process with the minimum of stress"